In recent years, there have been a few teams that always tend dominate the NBA&apos;s Western Conference: the Los Angeles Lakers, the San Antonio Spurs, and the Dallas Mavericks. The Lakers and Spurs are especially known for being forces out west, and the Mavericks have a strong reputation as well with two finals appearances in the last decade. This season, they&apos;re still looking to find their stride at 11-8, and tonight they&apos;ll meet the 9-8 New Orleans Pelicans. The Mavs are ranked higher than New Orleans in the Southwest Division, but the Pelicans come into the game on a three game win streak. Is New Orleans going to be able to establish themselves as a new force in the west? Catch the game tonight at 8PM. Just three years ago today, Dirk Nowitzki and the Dallas Mavericks were off to one of their hottest starts ever. At 15-4, they&apos;d won eight straight coming into their December 4, 2010 road game against the Sacramento Kings. Sacramento&apos;s Tyreke Evans had a big night with 25 points, but Dirk and the Mavs weren&apos;t going to let that stop them. Dirk Nowitzki shot a lights-out 11-15 from the field, putting up 25 points, 5 rebounds, and 5 assists as the Mavericks inched by the Kings 105-103. During the 2010-11 postseason, the Dallas Mavericks would end up going all the way, winning their first NBA Championship in franchise history. 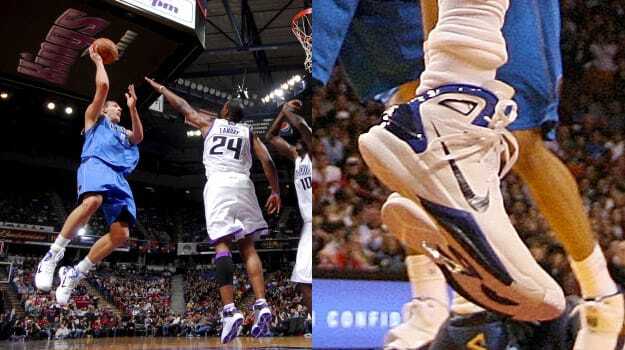 Dirk Nowitzki has been a Nike guy throughout his NBA career, and during this 2010 game, he wore a PE version of the Nike Hyperdunk 2010. This Dirk-exclusive was released to the public in limited numbers through Foot Locker&apos;s House of Hoops stores. Check out a detailed shot of them in all their glory in the gallery above.